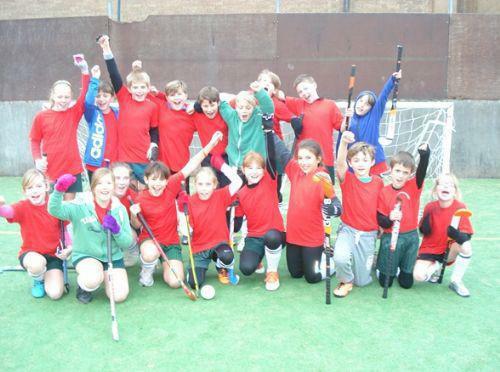 Success for the Meath Green quicksticks hockey teams! On Wednesday 27th November 2013 19 pupils from Meath Green hockey club went to Oakwood for a quicksticks hockey tornament. There were 3 schools taking part; us, Yattendon and Salfords, each school had 2 teams, A and B. The A teams were in one pool and the B teams in another pool. In their pool each team played 2 matces. The first match for Meath Green A was against Salfords where once we scored the first goal we just couldn't stop, winning in the end by 8 goals to 0. The second and final pool match for Meath Green A was against Yattendon where we carried on our fantastic play and with a brilliant team effort won again, this time 4-0. On the other pitch Meath Green B started with a match against Yattendon where we had most of the play but couldn't put the ball in the goal as many times as we should have, we kept fighting though and came out triumphant with a 2-1 final score. Meath Green B's final pool match was against Salfords and this was the closest game so far, both teams had many chances but were denied the goals by great defending, the final score was a frustrating 1-1. We then got to play one final match against our matched place team from the other pool. Miss Ledwich announced that both Meath Green A and Meath Green B had come first in their pool so we had to play each other in the final! It was an exciting match with no goals scored for quite a while but in the end after some fantastic team play and great use of the space for passing Meath Green A won 3-0. So the final result was Meath Green A 1st overall and Meath Green B 2nd, so overall a great day for Meath Green hockey!